In this lesson, we will learn how to apply the concept of translation to a point or a geometric shape and determine the coordinates of a translated image on the xy-plane. The point ( 3 , 5 ) has been translated three right and three down. What are the coordinates of the image? Start with point 𝐴 ( − 5 , − 1 ) . Translate it by 5 units to the left and 2 units up. 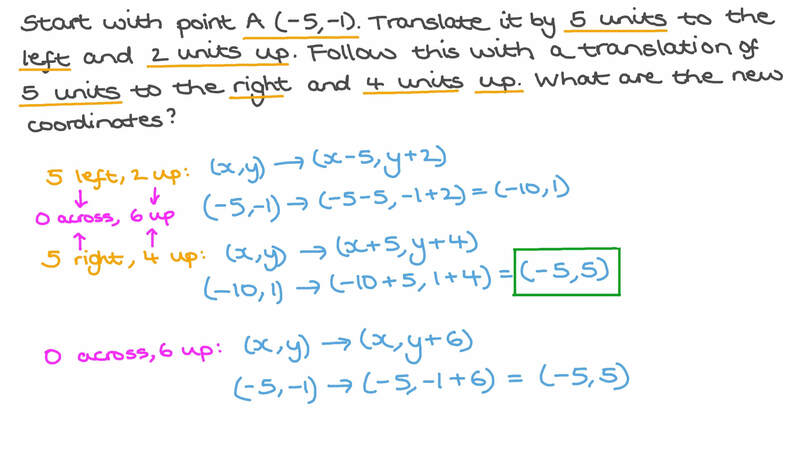 Follow this with a translation of 5 units to the right and 4 units up. What are the new coordinates? Determine the coordinates of the image of point 𝐵 of quadrilateral 𝐴 𝐵 𝐶 𝐷 after a translation 5 units left and 3 units down. Write the translation that takes point 𝐴 to point 𝐴 ′ . Find the image of a △ 𝐴 𝐵 𝐶 , where the coordinates of 𝐴 , 𝐵 , and 𝐶 are ( − 7 , − 7 ) , ( 4 , − 7 ) , and ( 2 , 1 ) , respectively, under the translation ( 3 , 2 ) . Find the coordinates of the point ( 𝑥 , 𝑦 ) after it is translated 𝑚 units left and 𝑛 units down. If triangle 𝑇 is mapped to triangle 𝑇 ′ by a translation, would the corresponding angles and sides in the triangle be equal? The vertices of a triangle are mapped using the function ( 𝑥 , 𝑦 ) → ( 𝑥 − 2 , 𝑦 + 3 ) . Which of the following single transformations has taken place? What is the translation that will move point 𝐵 to point 𝐴 ? A figure has been translated three right and two down and then translated a further eight right and six up. What single transformation could have been used? What is the name of the transformation that slides figures without flipping or rotating them? If a point with coordinates ( 𝑥 , 𝑦 ) is translated three right and two down, determine the coordinates of the image. What translation moves point 𝐴 to point 𝐵 ? Find the coordinates of the point ( 𝑥 , 𝑦 ) after it is translated 𝑚 units right and 𝑛 units up. Farida wants to change the location of her right-triangular desk. If she moves it only by a translation, will it fit exactly into one of the other corners of the room? A translation maps a point two right and four down. Which of the following functions represents this transformation applied to a general point ( 𝑥 , 𝑦 ) ? In the given figure, 𝐴 has been translated to 𝐵 . What function would describe this transformation? The points ( 8 , 1 2 ) , ( 1 0 , 7 ) , ( 1 3 , 1 4 ) , ( 1 5 , 9 ) are moved down by 7 units. What are the new coordinates? The coordinates of point 𝐴 and its image 𝐴 ′ after a translation are illustrated in the graph below. Describe this translation in words. Determine the image of the two points 𝐴 ( − 2 , − 6 ) and 𝐵 ( 3 , − 7 ) under the translation ( 3 , 3 ) . 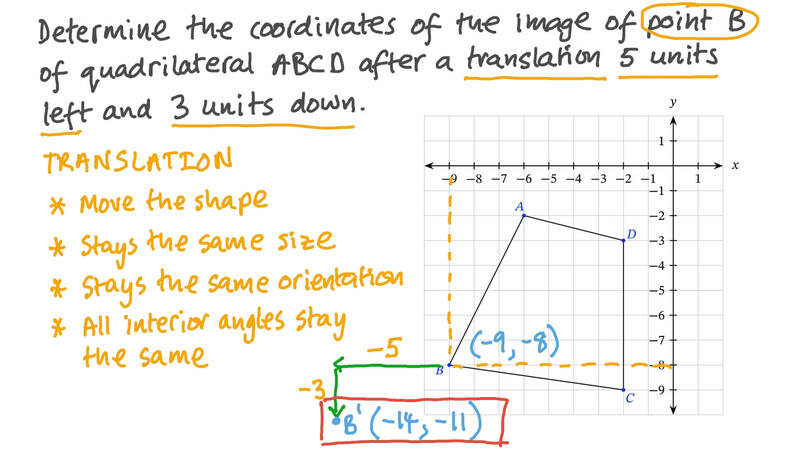 Find the images of the points 𝐴 and 𝐵 of the line segment 𝐴 𝐵 under the translation ( 4 , 3 ) . In the figure below, determine the coordinates of the points 𝐴 ′ , 𝐵 ′ , 𝐶 ′ , and 𝐷 ′ , where 𝐴 ′ 𝐵 ′ 𝐶 ′ 𝐷 ′ is a translation of 𝐴 𝐵 𝐶 𝐷 by ( − 2 , − 5 ) . 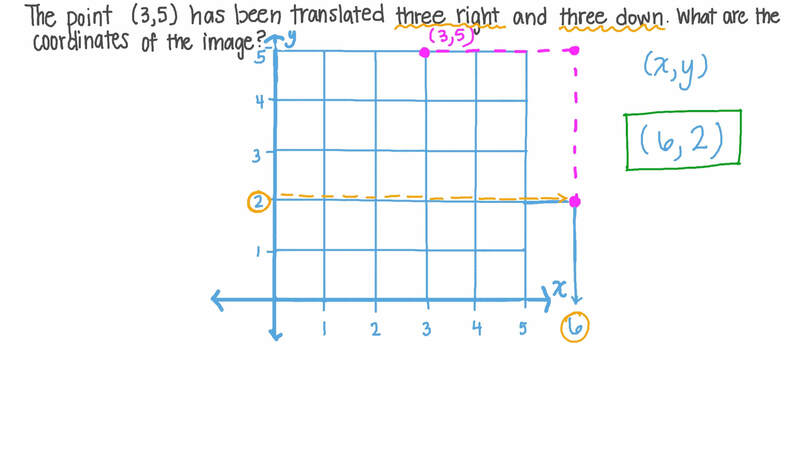 Find the coordinates of the image of ( 1 3 , 4 ) under the translation ( 𝑥 , 𝑦 ) → ( 𝑥 + 5 , 𝑦 − 2 ) . Given that the translation of point 𝐴 by ( − 9 , 7 ) is 𝐴 ′ ( − 1 , 2 ) , find the coordinates of 𝐴 . Find the image of the point 𝐴 ( − 7 , 1 2 ) under a translation of 13 units in the negative direction of the 𝑥 -axis.